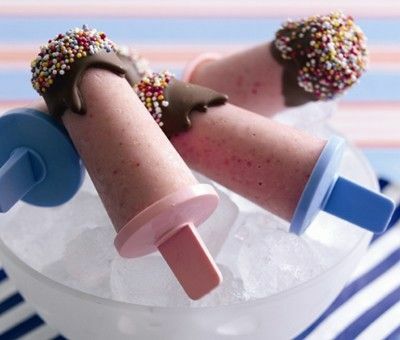 Make your own ice cream lollies. Once they're frozen, finish with chocolate and sprinkles for extra fun! 1. Whiz the condensed milk, fruit and juice in a blender until completely smooth. 2. Pour into the ice lolly moulds and then freeze until solid. 3. To finish, melt the chocolate. Un-mould the lollies by dipping the tray briefly in hot water. Dip each lolly in the melted chocolate and then into the sugar sprinkles. Serve immediately or wrap in cling film and keep frozen for up to 1 week. Try orange juice with fresh mango and pineapple instead of strawberries. Add more fruit juice to this recipe and chill down for a luscious drinkable smoothie! does the chocolate taste different if its left in the freezer for a long period of time? Hi Wendy, for best results store in the freezer for about a week. You can always dip the lollies in melted chocolate after they are frozen if you like!